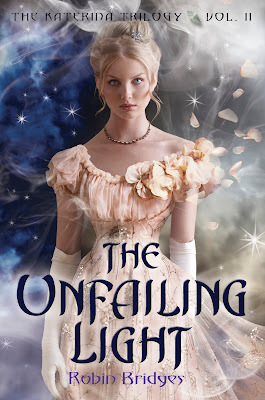 I'm absolutely delighted to be joined today by the wonderful Robin Bridges, author of the glamorous, gorgeously imagined YA historical novel / fantasy, The Unfailing Light. The Unfailing Light is the second book in The Katerina Trilogy, featuring intriguing Russian folklore, history and culture. To read my review of The Unfailing Light click HERE. To read my review of the first book in the series, The Gathering Storm, click HERE. 1. Welcome to Bookish Robin, I'm honored to have you with us today! Could you start by telling us a little bit about yourself? Happy to be here! When I’m not poking small children with needles at the hospital, I’m at home writing about monsters and making horrible things happen to my teenage characters. But people tell me I’m really quite nice. 2. How familiar were you with Imperial Russia and the folktales of Eastern Europe before writing the Katerina Trilogy? Was a lot of research required? Yes, it was a lot of research! I’m not sure I would have been brave enough to ever start writing the first book if I’d known just how much research I’d end up doing. I always loved Russian fairy tales, and I’d read a lot about Nicholas and Alexandra. For the Katerina Trilogy, I found books about other members of the Romanov family and books about the palaces they lived in. I created a LibraryThing account just to keep track of all the Russian history I’ve read in the past few years. 3. Would you say that The Unfailing Light was easier or harder to write than the first book in the series, The Gathering Storm? I thought writing the second book in the series would be harder than the first, but it was easier than I expected. I knew my heroine and her motivations and knew her flaws, so putting her into danger and watching her dig herself out of it was fun, in an evil sort of way. 4. What is your favorite part of the writing process? Least favorite? It’s weird but it changes for me from book to book. Sometimes, getting to know my characters in the first draft is my favorite part, and sometimes, that first draft makes me pull my hair out. 5. Do you have a favorite quote or line from a poem or book? “You pierce my soul. I am half agony, half hope. Tell me not that I am too late, that such precious feelings are gone forever. I offer myself to you again with a heart even more your own than when you almost broke it, eight and a half years ago. Dare not say that a man forgets sooner than woman, that his love has an earlier death. I have loved none but you. Unjust I may have been, weak and resentful I have been, but never inconstant." 6. Would you say that your life changed a lot after you got your first publishing deal? How did that feel? It’s been a lot busier! And it’s been a wild journey, a lot of ups and downs and lots of surprises too. I’m so glad I’ve had the members of the Class of 2K12 and the members of the Apocalypsies and the Elevensies on this journey with me. To hold my hand and share virtual chocolate. 7. What's next in line for you? Are you working on a new book now? Right now I’m waiting on copy edits for Katerina #3, The Morning Star, and finishing a new historical fantasy for my agent. 8. Could you share with us your Fall reading list? Random House US has generously offered to give away one finished copy of The Unfailing Light (trust me, it's GORGEOUS and you WANT IT!!!). 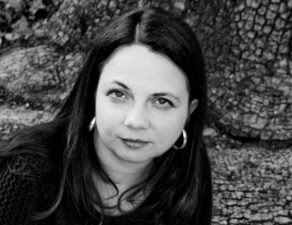 For more awesomeness from Random House US and Robin Bridges, please visit other blog tour stops! I'm not familiar with it but I'm always interest to learn more about anything culture related. I would love to learn more about Russian history and folklore. All I know is what I learned in high school history. I don't know much about Russian history & absolutely nothing about Russian folklore! I think it sounds really interesting and I would love to learn more about both! Thanks for the giveaway! I love learning the folklore of different cultures! It's so interesting to see the differences and similarities of various cultures. Being from Russia, I just love the folklore! I've been wanting to read this series for a while. I've had the Gathering Storm on my wishlist for a while. I haven't read the first book in the series, but it sounds fantastic. Awesome interview!! Great interview! Love the fall reading Lin up and totally agree with Unspoken <3 look forward to picking these books up!! I LOVE folklore. Of any shape or form. I've found it makes some of the best stories out there. I'm not too familiar with Russian folklore, but I do find it interesting. I'm looking forward to reading this series, it sounds fascinating. I am not familiar but it would be interesting to learn about it. Other than knowing the stories about Anastasia and Baba Yaga, I don't really know anything about Russian folklore/history. I always think it would be intriguing to learn about, though! I am interested in Russian folklore! When I was a young kid, I saw an animated version of Anastasia, and it became one of my favorite movies! I am not familiar with it, but I would like to read more of it to find out more about it. Not familiar with Russian folklore, but would love to learn more! To be honest, I don't know much about Russian Folklore other than reading Baba Yaga and a few Anastasia retellings, but I definitely want to read more! I know a little bit about the Romanov's but not very much. Other than that, me and Russian folklore are not very well acquainted. I very much wish to get acquainted with it though. And more power to her for being able to poke little ones with a needle. I would cry each and every time. As soon as I saw that little face pucker up. Nursing is obviously not for me! Thanks for the giveaway! I don't know very much about the Russian folklore but am curious about it. Thanks for the giveaway!!! I am definitely interested in Russian folklore! I've always been intrigued by the history of Russia, especially the czars (and the story of Czar Nicholas II, Rasputin, Anastasia, and that whole period of Russian history).